Lucy Sanford in her days as a top-selling Toronto real estate agent. For 25 years, Lucy Sanford was a top-selling real estate agent in Toronto’s west end. Not surprisingly, her busy life and successful career were filled with all manner of wireless devices. In addition to her cell phone and nearby cell antennas at her office, there were no less than 20 cell antennas on the roof of her residence. She also had Wi-Fi, a blackberry, and four cordless phones at home. And her fancy car was loaded with gadgets generating high electromagnetic fields. But, as is the case for an increasing number of people in our electrified and wireless world, there was a price to be paid. Lucy developed an extreme and ever-worsening case of electromagnetic hypersensitivity (EHS). The condition ultimately ended her career and sent her to the ER one night after she spent two hours convulsing in bed. However, it also set her on a long and fruitful healing journey, which she today describes as miraculous. Now, at age 60, Lucy is leading a healthy, vibrant life, and she is able to spend time (when necessary) in environments bristling with wireless devices without ill effect. She and her new partner are even thinking of building a sustainable community on a rural acreage in Ontario where they can offer their healing knowledge to others. 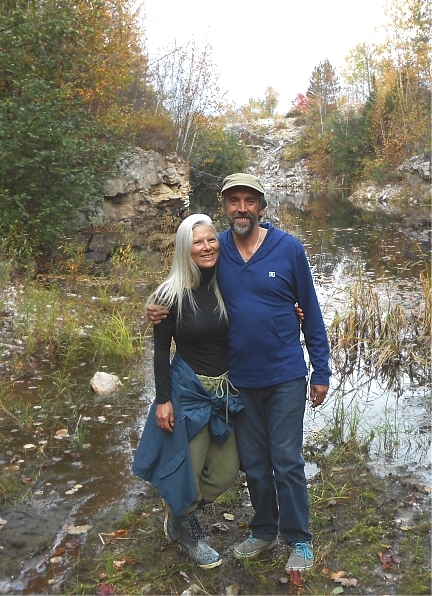 Lucy Sanford today, healed from devastating electro-sensitivity and enjoying life with new partner Alan Reed, a geomancer who balanced the energies on her property. “I believe people with EHS are the lucky ones,” Lucy tells me. “Our warning systems are forcing us to be aware of our environments and make changes and heal, as opposed to not feeling the warnings and getting something like cancer or Alzheimer’s. I would not change this experience,” she says of her 14-year ordeal with undiagnosed EHS in Toronto, and her subsequent 4-year healing journey in the much smaller Ontario town of Crystal Beach. The first symptoms of Lucy’s mysterious ailment, that would plague her life and confound her doctors for many years to come, began in 1995 when she noticed occasional numbness and tingling in her hands and ringing in her ears. Inexplicable nausea was also part of the equation. By 2000, her sleep was so disrupted that she was only getting two or three hours of intermittent sleep each night. “One night I went to bed, and all of a sudden I experienced what I can only describe as feeling like a bolt of lightning hit the left occipital area of my head,” she recounts. “It jolted me, my whole body convulsed, and then my bowels evacuated.” The convulsions recurred every ten minutes for the next two hours. Alone and terrified, Lucy called her father for help, and he took her to a hospital emergency room in Toronto. After being questioned by three different doctors for several hours, Lucy was ultimately transferred to the psychiatric ward of another hospital, where she remained for two weeks. “I was sent home with prescriptions for anti-anxiety pills and anti-depressants and a referral to a psychiatrist,” Lucy says. This pattern is all too common within the medical profession, even a decade after Lucy’s experience. So great is the medical community’s ignorance and outright denial of electrosensitivity, that many sufferers are still psycho-analyzed, drugged, and even involuntarily committed to psychiatric wards when they seek medical help for their potentially life-threatening physical reaction to wireless radiation. As Lucy’s symptoms multiplied (including the frightening effect of the entire left side of her body going numb and “drooping” for several hours at a time), her doctor speculated variously that it was due to menopause, Fibromyalgia, Chronic Fatigue Syndrome, and more. Lucy was tested for Lyme Disease and Multiple Sclerosis, and given MRIs, CT scans, a spinal tap, and other tests. But her ailment remained a mystery. In 2006, tests showed Lucy’s body was laden with heavy metals. The removal of her mercury amalgam dental fillings brought immediate relief from some of her symptoms. But by late 2009, Lucy was wracked with an ever-widening array of debilitating health problems—dizziness, nausea, extreme memory loss, slurred speech, intense leg pain, burning and itching, bronchitis, spasms throughout her head, numbness, chest pressure, inflamed thyroid, and much more. Life had become impossible. “I could no longer cope,” she says. Having exhausted all other diagnoses, her doctor speculated that Lucy may be electrosensitive and suggested she remove herself to a low-EMF environment on a trial basis to see if she felt better. 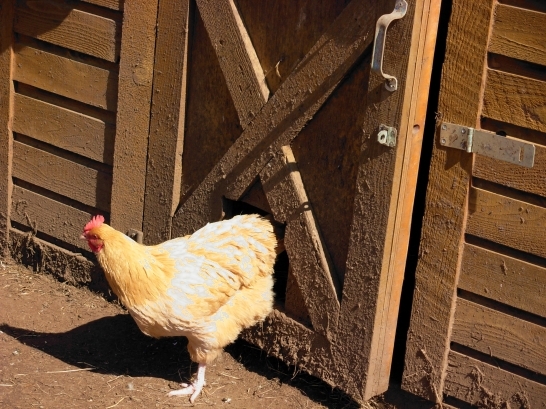 A short stay on a friend’s farm convinced Lucy that she had to permanently move out of the city. “I went to my girlfriend’s farm, and after only five days I was completely stunned!” Lucy recalls. “Almost all of my symptoms subsided enormously.” But her recovery was short-lived. In the two hours it took her to drive home along the highway flanked by cell towers, the symptoms returned. So in December 2009, she pulled up stakes from Toronto, abandoned her home, referred her real estate clientele to another agent, and moved to Crystal Beach, Ontario—determined to change her life and rebuild her health. In the ensuing four years, Lucy has devoted herself to cleansing and repairing both her external and internal environments. She has been so successful in her single-minded campaign to reclaim her life that today she is able to go almost anywhere with little or no reaction to electromagnetic fields. She is, for all practical purposes, healed. 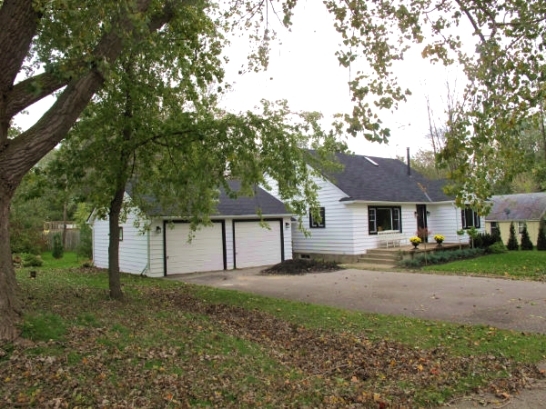 Lucy bought a house on a 1/4-acre lot in a small community two hours away from Toronto, and then gutted it to bare walls so she could completely renovate it for low electrical fields. Lucy’s first step was to remove herself from the toxic environment of electro-pollution and create a safe living space. She bought a house in an area with low electromagnetic fields and gutted it to the bare walls to renovate it for her condition. She used non-toxic materials everywhere since her hypersensitivity extended to chemicals as well. For house wiring, Lucy installed armored (BX) electrical cabling throughout her home so that the electrical wires in her walls were shielded. She also had each room separately wired, and with two “on-demand” switches per room (one for the lights and one for the outlets), so that there is absolutely no electricity in the walls of any room whose switches are off. And she ran DC wiring through the walls for lamps and a ceiling fan, powered by a battery that is recharged once every two weeks by the household AC. 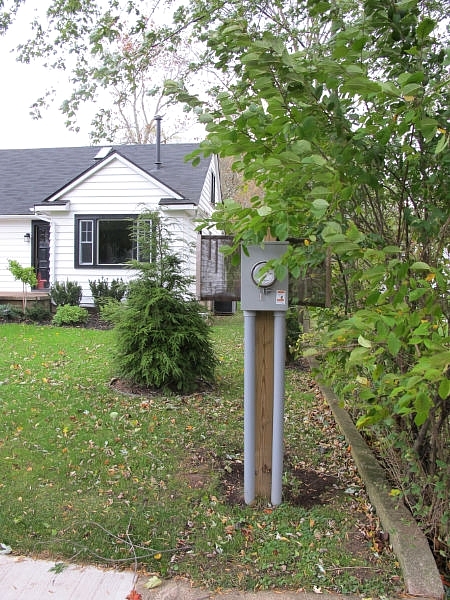 She had the smart meter (unavoidable in her region) moved off her house and mounted on a post on the corner of her property, and then shielded the backside with copper mesh. She buried the power cable coming into her home underground, and then grounded the house wiring to a grounding plate outside in the earth rather than to plumbing inside her home. She installed Stetzer filters, a Corcom filter, and an Eco filter to clean up dirty electricity that would otherwise be entering her home or circulating through her wiring from inside sources. She had the wireless smart meter (an unavoidable fixture in her region) moved from the side of her house out to the edge of her property. And she shielded the backside of the smart meter with copper mesh to block its radiation from reaching her house. To insulate her home from external sources of ground current travelling through the earth, she installed a continuous copper cable around the entire perimeter of her quarter-acre lot, and then grounded it to grounding rods at the corners of her property. 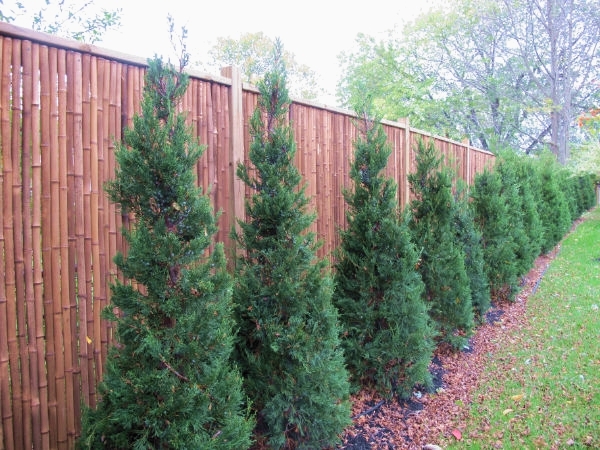 Lucy planted 85 trees and bushes on her lot to shield her home from future sources of wireless radiation. To top it all off, she planted 85 trees and bushes to help shield her home from future wireless radiation. For a while Lucy slept in a Faraday canopy, which brought the wireless radiation down to zero under the canopy. But after she hired an expert in biogeometry to rebalance the energy in her home, she found she no longer needed the canopy so she took it down. The final alignment of the energies on Lucy’s property occurred in April 2013, when she hired a geomancer named Alan Reed to harmonize the rest of the magnetic lines in her home as well as the underground water veins on the property. “It was after Alan’s work that my healing shot forward,” Lucy recalls. 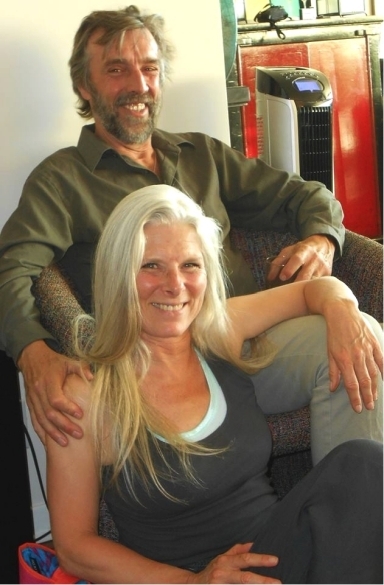 Lucy and Alan’s common interest in earth energies blossomed into romance and now life partnership. Alan’s latest gift to Lucy was a 3,000-pound quartz crystal strategically placed on a beneficial underground water crossing on Lucy’s front lawn. 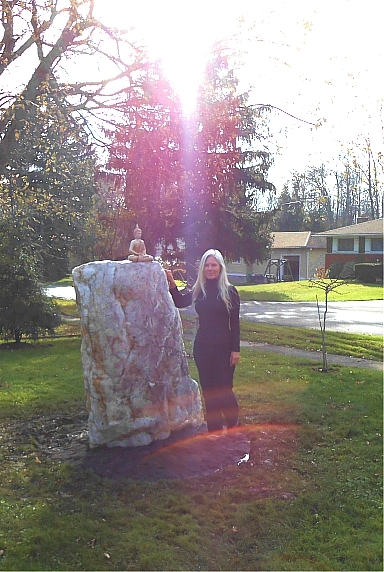 Lucy’s new partner, geomancer Alan Reed, gave her a 3,000-pound quartz crystal, strategically placed on a beneficial underground water crossing on her front lawn. Some will say the unexpected column of light engulfing Lucy in this photo is just lens flare. Lucy sees it differently. Clearly, Lucy was determined to leave no stone unturned and no energy field unmitigated in her attempt to create a safe haven from the electro-pollution of the surrounding world. And it worked. But unless she wanted to spend the rest of her life at home, that was only half the battle. Her inner journey has involved meditation, the power of positive thinking, a spirituality course, and copious reading on such topics as brain architecture, the unconscious mind, psychoanalysis, vibrational frequencies, Buddhism, the earth’s energy fields, underground streams, and geopathic stress. After two years of this intensive inner work, combined with her new life in a detoxed home, she says she was about 70 percent healed. But Lucy wasn’t willing to settle for 70 percent. She wanted full recovery. And she sensed that the remainder of the work would somehow involve the unconscious mind—a subject Lucy was already well acquainted with, having studied it for more than thirty years. So she delved more deeply into brain science and discovered a program called the Dynamic Neural Retraining System, developed by Annie Hopper. Lucy and Alan are weighing plans to develop a healing community and geomancy school on his 33-acre property in Ontario. In recent months, Lucy has made multiple trips to Toronto, spending extended periods of time in highly toxic environments filled with wireless devices, loud music, fluorescent lights, high levels of dirty electricity, and many other triggers. And through it all, she felt fine. Today, Lucy considers her traumatic past with electrosensitivity to be a blessing rather than a curse. What advice does Lucy have for those still struggling with electrosensitivity? This entry was posted in EHS Stories and tagged Alan Reed, amygdala retraining, Biogeometry, brain science, Geomancy, limbic system, Lucy Sanford, neuroplasticity, Toronto on January 23, 2014 by Kim Goldberg. Brain retraining (aka mind training) is definitely something to be aware of (and hopefully long before we need it), but is not effective unless you have taken all the other measures to reduce your physical load to toxic and harmful exposures (nor can it prevent all cases from manifesting). We still need systemic supports for those health care needs. Also, it’s important to note that brain retraining may not have the same results for everyone, because we have so many different factors affecting us. 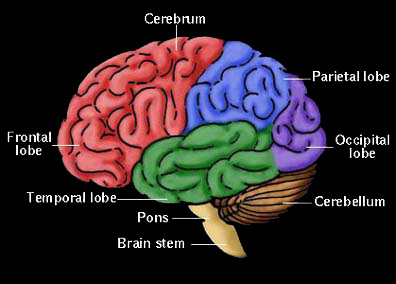 And not everyone who develops environmental sensitivities has a limbic system impairment. I am happy that some people are finding the programs helpful, because it doesn’t make sense to suffer when there is something we can do something about it. I also hope that there are (independent) efforts being made to develop a pre-screening tool that will allow people to see if they are good candidates for the brain retraining programs, in order to avoid being disappointed (or crushed) when they don’t work as advertised. I agree, Linda, one must have a multi-faceted approach to health recovery for electro-sensitivity. There is no magic bullet, no one single “cure”. And Lucy’s story really demonstrates that. She pursued so many different avenues, starting, of course, with reducing her exposure to signal… which is probably the essential starting point for all EHS people. And then, after several years of personal study, the brain retraining was, for her, the final component that brought many other streams of study and knowledge together for her, and completed it all. During my years of isolating myself in a safer environment, I ‘met’ many other people suffering from EHS over the phone. It was an amazing network of people helping each other through emotional support and we would share our stories of what worked and didn’t. It was a lifeline! It was one of these people who introduced me to the idea of positive awareness and healing as that is how she healed after reducing her EMF living environment as much as possible. And she lives in the middle of a large city! She’s kind of a heroine to me. I definitely agree with you that we have to reduce the toxins in our environments as well as in our bodies. My story does not take away from any of that. We all have different experiences. This is just my story and, gratefully it did work for me as it is also working for others. I do know that one has to believe it’s going to work in order to have it work. Thankfully we are all here to help each other in various ways. This sharing alone goes a long way in healing – thanks to Kim for putting our stories forward and allowing us this space to connect. Thank you Linda for taking the time to comment on my story. I wish you well on your journey. Good news is good to hear! I really hope your dream of a sustainable community comes to be too! I live in Vancouver, BC and have been adversely affected by EMFs in a brand new building that I rented an apartment. I felt my body being changed from the inside out. I have been forced to move but now it seems I cannot get away from the trouble. I am a renter. I am not wealthy. I love Lucy’s story, I truly do, but this gives me no hope for healing. If this is what it takes to recover, I have no chance. Nor does my dog. What do those of us without the financial means, do to get ourselves back? I am struggling to find a way to simply afford the bed canopy and mat, I have no idea how I could ever make enough money to do anything else, aside from winning the lottery. I don’t even play the lottery! I’d love to hear stories about how people like myself have recovered from EMF poisoning. Please don’t get me wrong, Lucy, I truly love your story and I am sincerely happy for you, but really, it gives me little hope for myself, if what you did, is what it takes. Thanks for stopping by my Refugium website and sharing your own experience! The important point about Lucy’s story, in my opinion, is that it shows us the body can be healed/desensitized, can come back from EHS. Although admittedly Lucy’s approach did take money. And of course, the ultimate goal is not really to desensitize our bodies to be able to tolerate the toxin of EMF/RF. Since all the health damage from it is still occurring. The better societal goal is to somehow get rid of the EMF/RF. Yet when we live in a world where high levels of artificially created EMF/RF seem nearly ubiquitous, then desensitizing the body to some degree at least allows an EHS person to survive on a day to day basis, go to a store, hold down a job, etc. While the sleeping canopy is expensive, there is a smaller ‘sleeping sack’ version that is very inexpensive. I know an EHS woman on Vancouver Island who slept in this comfortably while living in a condo. She said it made a big difference. But basically, hard as it is to achieve, the solution that many are left with is to change their life and location entirely. This may mean leaving big city (and job/income) to live off-grid in some remote cabin. Or it may mean living in a van/RV and parking/staying wherever your body feels good, and then moving on if things get bad in terms of frequency. Or it may mean doing the best you can in a city environment. This is different for everyone depending on what they can and can’t tolerate. I know another EHS woman on Vancouver Island (Nanaimo) who lives in town but in her own house (not apartment condo) and has kept a smart meter off her house. So she has zero wireless RF devices anywhere in her home or on her property. Her neighbors have that stuff, of course. But she is okay on her own property, which includes organic garden. She also has a basement suite for rent if you are interested. I totally understand where you are coming from. I was indeed very fortunate to have some money from my old work to buy a house and change it all. That is what it took for me to get better. But others took less. The other thing I have learned, since Kim’s article some years ago now, is that I was so scared by the illness that every symptom I had, I attributed to this illness which only made me more scared. I am just now completing the Building Biology and Ecology course and getting my certification as an Electromagnetic Radiation Specialist. And during that course, I got sick again and thought it was EMF. But what I found was that I had had mold in my house. It wasn’t black mold, it was a different kind and it did not smell but it made me sick. And all the time I thought the EHS had come back. Then I had to heal from the mold and do all the remediation. But it taught me a valuable lesson: that there are many things that can add to the stress we feel and one of them is a new building (which you mentioned having just lived in) which can gas off and cause many of the same type of symptoms as EHS. It is a horrifying thing that is going on and that you are going through and can be a horrifying illness and it can also be an expensive illness to deal with! However, I know of others who are having to deal with this and are doing the DNRS program by Annie Hopper and who are starting to feel better and their environments are not perfect. It is still an investment if you send away for the program and do it at home but much less so than some of the other fixes. And no, doing the rewiring part does not take away the fact that EMF are harmful to the environment and to human health! But it does help you to deal with it and stop the automatic unconscious program in your brain that instigates the symptoms. It is imperative when you are sick to get your environment as safe as you can. But if you can only do so much, then it is even more important to do something like the DNRS program. I have a good friend, Veronica who also healed herself of EHS and did not have a lot of money to do things. She, as well used the power of her mind to heal and did what she could in her house. You can go to her website, http://sowegrounded.yolasite.com/ and see what she did with little money. Perhaps that will help you. You can also go to my website at http://www.lucysanford.com and read my article on Healing Body, Mind & Spirit and I have listed some things there that also cost little money. You must find a way to disconnect from the fear. The fear in itself will make you sicker. I know it is a very difficult position but if you have done the best you can, what else can you do but try something that may help pull you out of much of what you are feeling? I send you blessings and love. Thank you Lucy and Kim, for your kind and patient answers. Fortunately I have had a friend come to my aid and has helped me by purchasing some filters to install in the electrical outlets of my apartment as well as a canopy and mat that can be grounded! I am blessed to be trusted to make payments in order to be given the benefits that can come with these tools, to facilitate recovery and healing. I do not use wireless and avoid many other things that seem to have adverse affects on me. I think the best I can get started with are the canopy and mat so I can get the regeneration that happens in our sleep, if we are sleeping in a safe environment. I am so grateful to both of you for your loving, kind answers to my very real fears and concerns as a low income person who believes in healing holistically. I am so very glad to hear all this! I am going to ask you if you would consider changing your name name here from Scared to something more hopeful now that you are! Please know that when you use a canopy in your bedroom, you should also turn off all the breakers that go into that bedroom so you have no electrical on in the room or the walls of that room. This is great news! These are wonderful stories. I am wondering, my girlfriend has been suffering from EHS(she actually posts above, as ‘Scared’) and we have started the process of hopeful protection and eventual healing. Is the group of fellow EHS sufferers you mentioned in your top comments here, a public group that I or others may access? Was it entirely via phone? We read a lot online but, other than this, have yet to be able to communicate directly with anyone who has improved. Without getting into too much detail, there is one specific instance of being affected by EMFs nightly that we are trying to zero in on, to discover exactly what it is (it still occurs despite nightly shielding in a grounded canopy) and if other sufferers endured the same side effect and how they coped with, or remedied it. She lives in a large city and cannot relocate so your friend who WAS able to recover in a city would certainly be someone I would love to connect with. Just wanted to thank you for your stories and strategies; and I am grateful you found a way out of this, and grateful for any advice you could grant us. Hi Adam – Lucy Sanford here.. The group of phone buddies I had came through word-of-mouth. It is my friend Veronica who got better by still living in a city. You can go to her website at http://www.sowegrounded.com and read some of her story and connect with her. Please do let her know that I referred her. She is a beautiful person and has much knowledge. I found this very useful practical guide, it helped me to get exactly what I need rather then experimenting with various kinds of emf protection! Good article Piter. You are right, experimenting without full knowledge on what can be a complicated situation can be both costly to both health and pocket book.